Let's say you have a bunch of Google Documents with various images in them - say a logo or photographs - anything, that you'd like to replace with different images. Well, one way would be to go in there and do it all manually. If the images were differently sized you might need to do some adjustments, but eventually you'd get it done. But you can do it systematically with Apps Script. They key to it is to be able to recognize an image in a document so you can replace it with another. Let's start with a document with some pictures in it. You might have a number of documents where you are using the pictures below - and you need to replace the images when there's a change. You create a template document which contains all the images you want to swap - the before and after. 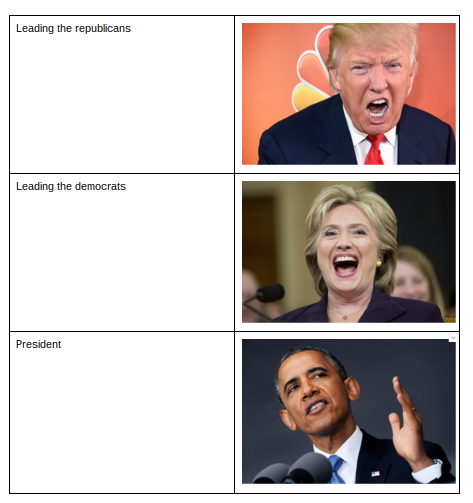 This template can contain anything you like, in addition to a table which has exactly 2 images on each row- the first image is the image to look for, and the second image is what to replace it with. The table can have extra columns if you like, as well as any other stuff. It's only table rows with exactly two images that are of interest. 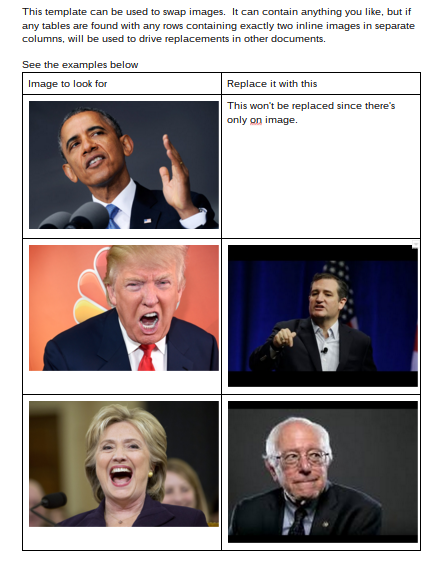 Using the template above, any instances of donald and hillary found in the documents being processed will be replaced by ted and bernie. 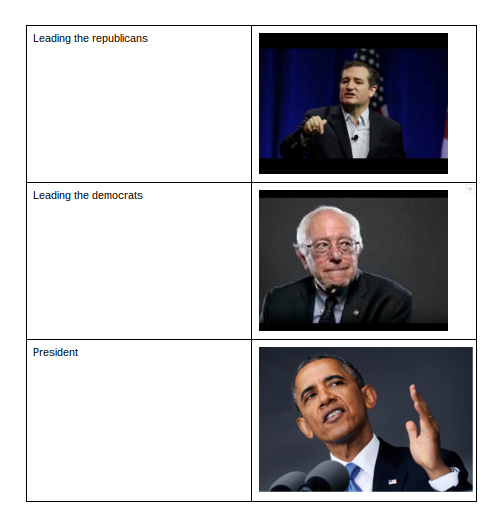 Obama pictures will be left intact for now, since he has no replacement picture in the template. 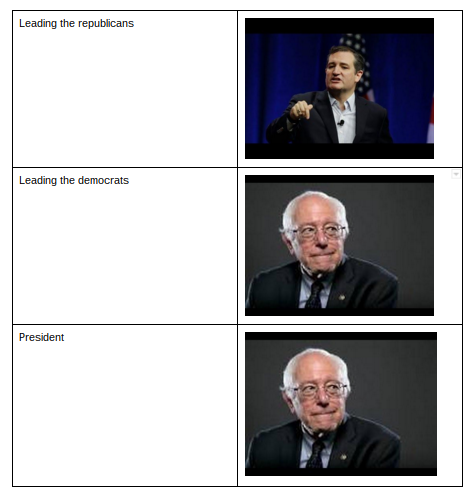 In a later run, I'd add the picture of bernie next to obama so it could replace his. Here's how to control how the processing is done. scaling:SwapperEnums.SCALE_ORIGINAL_HEIGHT, // change this as required. You specify the id of the template, plus a list of documents to be processed as well as sections of the documents that should be searched for images to change. Attributes of the document such as any links can be inherited from either the original image, or from the attributes of the replacement image. Similarly the scaling can be inherited, or calculated. Here's the list of values you can specify. The proper selection of these can be used to keep the format of the document being processed whilst still retaining the proper proportions of the replacement image. If you don't want to specify a list of ids, you can use Creating a pile of files list from Google Drive to generate that list for you. For example, here's how to find all the documents in the folders and subfolders of a Drive path, and use that to add document ids to the file path. // just interested in the ids. You'll get a report at the end showing which documents were looked at and how many images were there. If you've used the method above to automatically create the list of files, you can enrich that result with details about the files too. and the report would look something like this. You'll see from below that it's perfectly okay to have your template in the same pace as your files. It will never replace the template contents if it is provided as a file to process. +Richard Anderson posted this video showing how he used this imageswapper to change the logo on his school's documents. You'll need the cUseful library, since it uses some functions there for blob processing. Note that this technique recognizes identical inline_images even though they have been resized in Docs. // there are twp ways of specifying the documents to look at .. one is simply to provide a list of document ids.